X Factor runners up JLS have gone straight to the top of the UK charts with their debut single Beat Again, the Official Charts Company said. The boy band, who came second to Alexandra Burke in the ITV contest, formed in 2007 but signed their record deal with Epic in January. Michael Jackson has held on to the top of the album chart for the fourth week in a row. The late singer also has five singles in the top 40. Jackson's Man In The Mirror fell from number three to eighth place this week. Billie Jean, Smooth Criminal, Thriller and Beat It also featured in this week's chart. The Essential - one of Jackson's greatest hits albums - is at number one for the third week. Number Ones was at the top directly after his death last month and is now at number 10. Thriller climbed one place to number three, followed by the Jackson Five's The Motown Years and down four places to number seven was another Jackson album, Off The Wall. 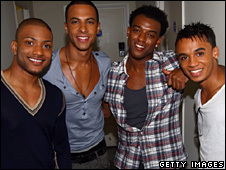 JLS, whose name stands for Jack the Lad Swing, knocked Cascada's Evacuate The Dancefloor off the top spot. Black Eyed Peas jumped from number 10 to three with I Gotta Feeling, La Roux's Bulletproof is fourth and Lady GaGa rounded off the top five with Paparazzi. Besides JLS, the only other new release in the top 10 was Chicane's Poppiholla at number seven.